On the heels of the D-Day invasion, Germany thrust the full might of its armored divisions against the Allies from June to August, 1944. Within just ten weeks they would be defeated. This highly illustrated volume takes us from the initial struggle to gain control of Caen after the D-Day landings through the disastrous Allied breakthrough at the end of July. 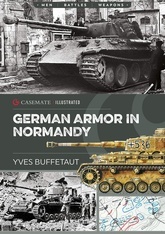 The story comes to vivid life through over 100 photos, diagrams showing the composition of German armored divisions, and color profiles of tanks and other armored vehicles. Focusing on the organization of the ten Panzer divisions that took part in the campaign, the vehicles they relied on, and the battles they fought, it reveals why ultimately their combined strength was not enough.